Time For a Stick Shift. 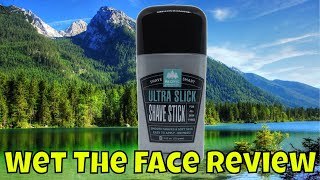 ​Incredibly easy to apply and mess-free, this shave stick will completely change your shaving game. Just rub it directly on wet skin (whether or not you even lather is up to you) and shave away! Perfect for your face, head, legs, underarms, sink, shower, bathtub - anywhere and everywhere you shave. Directions: Apply directly to wet skin, with and against the grain of your hair growth. If a lather is desired, massage into skin with your hand or a a quality brush. 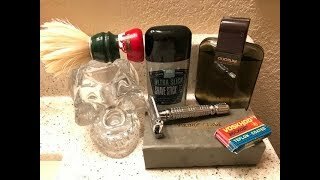 Enjoy your shave! For face, head, legs, underarm - anywhere and everywhere you shave! 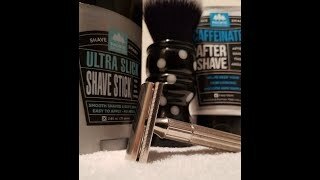 UBERLATHER RECIPE: Apply shave stick underneath your favorite Pacific Shaving Company shaving cream. Use quality brush to create an ultra-rich, incredibly slick lather. Ease of a stick .. slickness of Cremo. Lathers well with a brush. Great idea! Many of your competitors will now most likely copy this idea. Some may confuse it for deodorant, - so you may want to change the look of the packaging or graphic. Maybe make the outside graphic look like a wide razor. 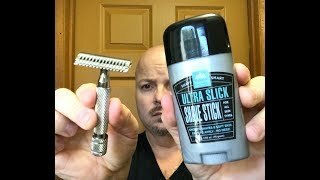 Easy to apply and gives a great shave. I really like this product for shaving my head. It goes on easily. It builds a great, slick lather especially when using a shaving brush. It also doesn’t dry or irritate my scalp like most products do. And, it does so without any menthol or lanolin, both of which I am allergic to. I usually have enough lather on my brush to use on my face as well. It works great for faces as well, as these other reviews will tell you. I think I will use this product as long as they keep making it. Michael M.
Ultra Slick is Ultra Slick! While this isn't a true shaving soap stick (it doesn't contain any soap), it behaves exactly like one. It has a light spearmint oil fragrance which could stand to be stronger and it leaves the skin feeling moisturized and soft once you finish shaving. Wet your skin, liberally rub the stick all over your stubble, and then work it into a lather with a slightly wet (not dripping) shaving brush. PSC should include the mention of a shaving brush on the packaging because this stick builds a really thick and super slick lather this way. It is easily one of the slickest products I have shaved with. You could also use this just to wash your face before shaving. Additionally, I think it would work as a nice slick base layer/pre-shave for a different soap or cream since its scent is so light. Stick it to the competition!